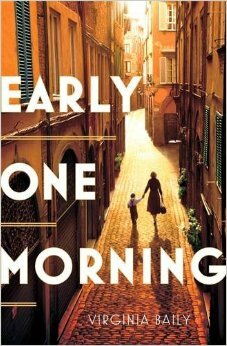 One morning in 1943 Chiara Ravello is paying a visit to her brother when she catches the eye of a woman and her family who are being taken away by the Nazis. Before really considering what she's doing she claims the woman's son as her own nephew, saving him from a fateful journey, likely to a concentration camp. Now she must flee the occupied city in search of her Grandparent's home in the hills and protect this disturbed young boy, Daniele. Three decades later, Chiara has a phone call from Maria, a teenager whose world has been turned upside down by a revelation that her father was an Italian man named Daniele Levi. Chiara must finally confront the past and the difficult life she shared with the boy she couldn't help but love as if he were her own child. This novel has an interesting concept, and is a different take on a story set in this period. Moving between the two time frames, Baily effectively builds up a picture of Chiara's relationship with Daniele, and his ongoing struggles with drugs and crime. The reader is led to wonder how many of Daniele's problems stem from the trauma of being taken from his family. I found this novel to be a slow starter and it wasn't until I was more than half way through that I was convinced I'd stick with the story. I enjoyed sections exploring Chiara and Daniele's time in the hills, harbouring members of the resistance and hiding from the Nazis, but in the other time frame, Chiara's life seemed slow paced. Maria's arrival in Rome acts as a catalyst for Chiara's consideration of all the trouble she had with Daniele and the plot is very well constructed. It was a pleasure to read a book in which the writer did not feel the need to tie up all of the loose threads, and the ending was satisfying because of this. I had the sense that the characters would carry on without us. Thanks to the publishers for providing an advanced copy of this title via Netgalley.